All transactions are safe and secure with a reliable history in online purchasing behind each of our associates. 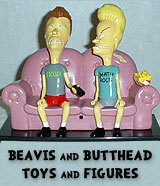 Buy the Beavis and Butthead Action Figures, Dolls and Toys to own Beavis and Butthead clothing and merchandise. Relive the 90s with these collectible Beavis and Butthead dolls, action figures and toys, including the Beavis Cornholio figure, character bobbleheads, plush dolls and the T.V. Talkers toy (pictured on the left). The toy works with any TV remote control. Simply press a button and the characters talk, repeating some of their most memorable phrases. In addition to the Beavis and Butthead Action Figures, Dolls and Toys above, browse the Beavis and Butthead Clothing Gallery for more apparel like men's and women's clothes, kids shirts or hoodies.